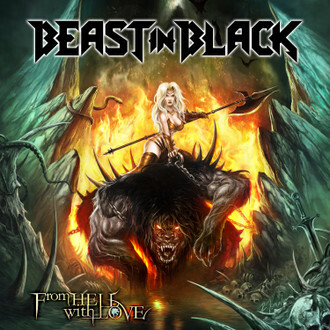 Beast in Black was formed in 2015 by Anton Kabanen – guitarist, songwriter and founding member of Battle Beast. In many ways he’s continued with what he was doing in Battle beast – writing catchy power metal songs with some pop influences. I saw Beast in black live for the first time last year supporting Nightwish in Paris and was impressed by how good a reaction they got from the crowd – this is a band that really does know how to put on a great show. Their debut album (Berserker) has been out for two years now and it’s now time for the second album – From Hell with love. “Oceandeep” is a soft acoustic ballad and is a real change of pace compared to the rest of the album. The songs are all really catchy and infectious but there’s plenty of power and heaviness too. It’s a great fun power metal album that’s well worth a listen. There’s nothing groundbreakingly new or original, but that doesn’t matter – it’s just good fun catchy power metal that’s very easy to enjoy.